While this past weekend’s Melissa McCarthy-hosted episode of Saturday Night Live was full of hilarious moments, one of the funniest was apparently left on the cutting room floor. 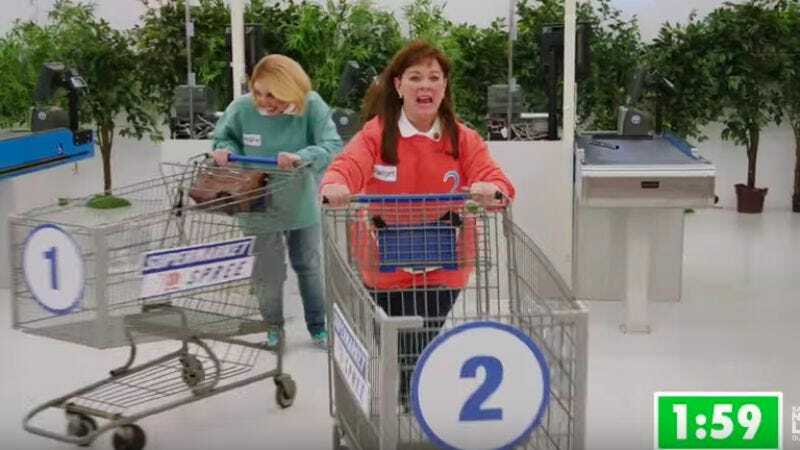 “Supermarket Spree,” a video sketch that was cut for time, has made its appearance on the SNL YouTube page, and it’s a witty, off-the-wall trip down memory lane for anyone who spent countless afternoon hours parked in front of Supermarket Sweep. In the clip, McCarthy plays Padget, a Spree contestant with a very specific plan for the show’s final big round. While her competitor, Vanessa Bayer’s Melanie, spends too much time considering the price of dried beans and family sized packages of macaroni and cheese, Padget goes straight for the big-ticket items—and not in the way most actual Supermarket Sweep contestants did. If, after watching this clip, you’re hungry for more Supermarket Sweep content—and who wouldn’t be?—check out this Expert Witness interview The A.V. Club did with a former Sweep contestant. Spoiler alert: All that food on the show was fake.